Big If True: Why Would GM, Amazon Invest In Rivian? An Amazon Prime delivery truck spotted in Normal last month. It's a sign that the online retail giant is looking to build its in-house logistics operation. This week’s Reuters report that GM and Amazon are considering investments in the electric startup Rivian raises all sorts of questions. Why? How much? And what does this mean for Bloomington-Normal? For all the speculation, several auto industry and technology analysts tell GLT the one definite takeaway is that it’s a vote of confidence in Rivian. Until now, Rivian’s only publicly known financiers were Saudi conglomerate Abdul Lateef Jameel, its largest shareholder; Sumitomo, the Japanese company with a U.S. operation based in New York; and Standard Chartered Bank, an international group based in London. No one knows exactly why GM and Amazon might be seeking minority stakes in Rivian, which has its manufacturing plant in Normal. All three companies won’t comment on the Reuters report. Rivian founder and CEO RJ Scaringe with the company's R1S electric SUV at the LA Auto Show in November 2018. Rivian's own trucks and SUVs will be built on top of the company’s so-called “skateboard,” a high-tech platform that will house its battery technology. Speaking last fall at the LA Auto Show, Scaringe told GLT they want to sell that technology to other companies. This GM-Amazon development is being closely watched in Bloomington-Normal. Rivian won millions in local and state tax breaks to buy the former Mitsubishi Motors manufacturing plant. Rivian plans to begin making its first electric pickup trucks and SUVs next year, eventually ramping up to 50,000 vehicles. Rivian has promised to hire 1,000 full-time workers in Normal by 2024. Partnerships with GM and Amazon could be a good thing for the plant, said Sam Abuelsamid, senior analyst at Navigant Research in Detroit. Could the plant actually be busier because of these investments? “Rivian might be able to sell 20,000, 30,000, or 50,000 a year within a few years (of its own vehicles), but if they had GM and potentially Amazon using their platform, they could ramp that up to full capacity (at the plant) within a couple years,” Abuelsamid said. If the Reuters report is true, analysts tell GLT that Amazon’s investment aligns with the online retailer’s other recent moves. Instead of relying just on UPS or FedEx, Amazon is now building up its in-house logistics operation, recently growing its own delivery fleet to 50 aircraft. You might've seen Amazon Prime trucks popping up in Bloomington-Normal in the last few months. “I can certainly see where it would make sense for them, if they had access to a platform like this, to have their own electric vehicle. Which would potentially save them a lot in operating expenses,” Abuelsamid said. There’s a parallel between Amazon-Rivian and DHL’s acquisition in 2014 of an electric delivery van maker called StreetScooter, said Colin McKerracher, the London-based head of advanced transport for the BloombergNEF research service. 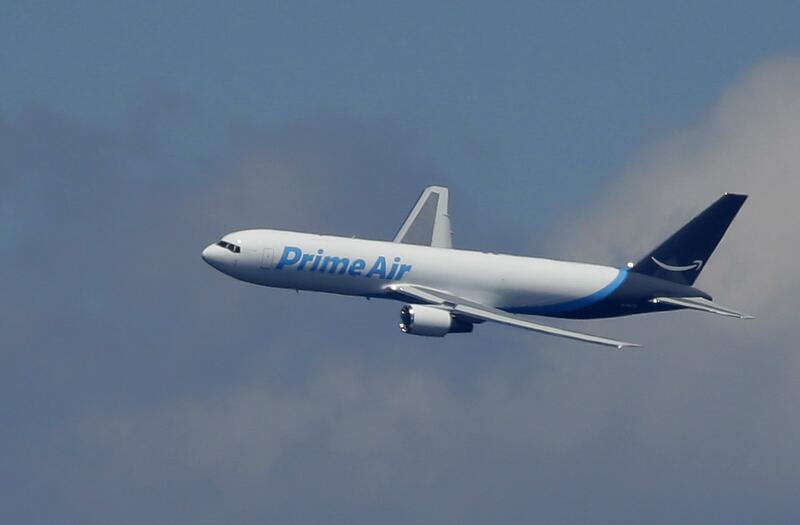 A Boeing 767 with an Amazon.com "Prime Air" livery flies over Lake Washington in 2016. McKerracher said the reasons for a possible GM investment are less clear. “Teasing out GM’s motivations is difficult,” he said. In a statement, GM did not respond directly to the Reuters report—or deny it. “We admire Rivian’s contribution to a future of zero emissions and an all-electric future,” GM said. GM said it wants to introduce 20 electric vehicles by 2023. And while many electric SUVs are on the horizon, the big automakers have been slow to get an electric pickup to market. Rivian aims to be the first. Mike Ramsey, the Gartner analyst, said there's precedent for GM to invest in small tech companies that do, say, GPS mapping or the LIDAR technology at the core of self-driving cars. “This is essentially investing in a competing—theoretically—automaker, in the early stages. So it’s a bit of a difference for them,” Ramsey said. This type of investment is not unheard of. Toyota and Daimler were both investors in Tesla, which to date is the only electric startup to move into the mainstream. For GM, an investment in Rivian could be a relatively low-cost way to have some exposure to the future of electrification, McKerracher said. Something more strategic and product-driven could also be happening, Ramsey added. “It’s not just a stock gain. Because that would really far down the line. But (it’s) the ability to share technology and be essentially a supplier to Rivian, and the other way around, that Rivian could be a supplier to General Motors for its lineup,” Ramsey said. What about for Rivian? Why does maybe pairing up with GM and Amazon make sense for a company trying to make a name for itself? Global automakers still have a huge advantage in successfully mass producing vehicles, said McKerracher. Even companies like Tesla have burned through cash and missed production targets. “If Rivian does end up with an investment from GM, I’d imagine that would be a part of their reasoning—access to that manufacturing expertise and knowledge. It looks like they’ve got a great team built up and a promising future ahead,” McKerracher said. Rivian has been quiet since the Reuters report. “We don't comment on media speculation,” said spokesperson Michael McHale. UPDATED 9 a.m. | Amazon and General Motors are considering making investments in Rivian that would give them minority stakes in the electric vehicle startup, according to a published report. Three years ago, Wade Jensen punched the clock for the last time at Mitsubishi’s manufacturing plant in Normal. When you watch Rivian’s promotional videos, their electric vehicles are always speeding across the beach, winding through a forest, or heading to some sort of adventure.